Designed and custom built for the education sector and will suit all age ranges. The CanDrive Light 16 Seater is IVA tested, Light on Your Pocket, Light on Fuel and Light on the Environment. May be driven on a standard B driving licence, no expensive and time consuming D1 licence training required (conditions apply*). New vehicles can be first registered as a minibus for schools and charities. The base Peugeot vehicle features a 2.0 BlueHDi Euro 6 diesel engine and 6 speed manual transmission, meaning excellent performance combined with impressive fuel economy and low emissions. Heated electric wing mirrors with 4-way adjustment, electric windows, Bluetooth connectivity, DAB radio, remote central locking, height adjustable driver's seat and steering wheel are standard equipment. We also ensure our CanDrive Minibus range are fitted with heated rear windows as an upgrade completely FREE OF CHARGE, all making this a comfortable, safe and pleasing vehicle to drive. Rear saloon passenger travel is provided with M2 tested and certified seating, all seats fitted with a headrest and an all age adjustable 3-point seat belt. It is insulated, carpet lined and fitted with courtesy lighting throughout. The rear saloon floor is overlaid with a nonslip covering. 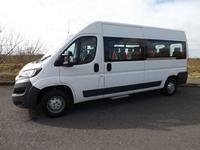 Purchase this Peugeot Boxer Minibus from £22,995 VAT or lease from as little as £13 VAT per day over 5 years. Still wondering whether to buy or lease a new minibus? Our unique Try Before You Buy and Try Before You Lease deals let your establishment experience a minibus for up to 6 months, with no long-term commitment or obligation.